Life is tough for a street punk–er, street cat. Comedy in manga comes in many forms. Sometimes you get a four-koma (four panel) manga with expressive characters and powerful punchlines. Other times, you get a slice-of-life manga with quirky characters and entertaining interactions. And then still others, you get a manga that’s so over the top throughout that you can’t take it seriously, but still enjoy the gags. I love a good laugh, but I’m grabbed just a little more when a series can take a serious turn amidst the comedic antics. That’s why Nyankees immediately caught my attention. Nyankees by Atsushi Okada follows Ryuusei, a stray tabby cat depicted as a street thug, as he enters Nekonaki Town in search of a cat from his past. However, Nekonaki Town is full of territorial felines, and they’re not about to let Ryuusei do what he wants. Thus, we get an exciting clash of teeth and claws as Ryuusei fights his way through town—making plenty of friends and enemies along the way. Ryuusei stirs up trouble with the town’s local street cats. One of the things that really surprised me about this volume was how action-packed it was. Though the volume was largely comedic, at times I felt like I was reading a shonen manga. Ryuusei is exactly what you want in a protagonist. He’s rebellious, free-spirited, clever, and a bit silly. Likewise, the other characters bounce well off of him, reacting hilariously to his antics and showing off their own distinct personalities. The fights are also a big plus in the volume, delivering the gritty, realistic experience of gang fights in the streets. This makes the volume feel thrilling and fast-paced. Ryuusei is a stray cat that doesn’t care about rules! Along with the manga’s well-done serious tone, the comedy mixes in smoothly. 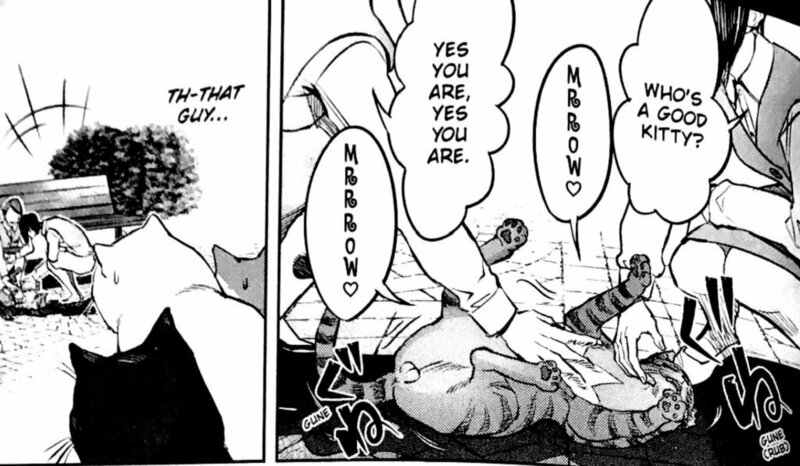 Tension-inducing fight scenes become ridiculous when the panel shows the cat counterparts wrestling each other. Normal cat-like activities become incredibly humorous when depicted from a human point-of-view. Some of the best comedic scenes show the real humans having no clue what the cats are really thinking, leading to some great thought-provoking sections that any cat lover will enjoy. Ryuusei acts cute to get food. While this volume is full of great humor and action, the lack of plot does concern me a little. Nyankees has some great fights, but it’s not quite clear where the story is going or what it will become. Ryuusei also has a goal that feels a little too easy to achieve, given the ending of the first volume. That choice left me feeling a little disappointed, but my hope is that there’s more to his goal and more backstory to unfold as the series continues. What impressed me the most was the character development in the first volume. Ryuusei is a bit rough around the edges, but he has an incredible bravery when it comes to protecting others, and his rebellious nature makes him a unique, yet fitting, street thug protagonist. Along with Ryuusei, we also learn a bit more about some of the side characters. 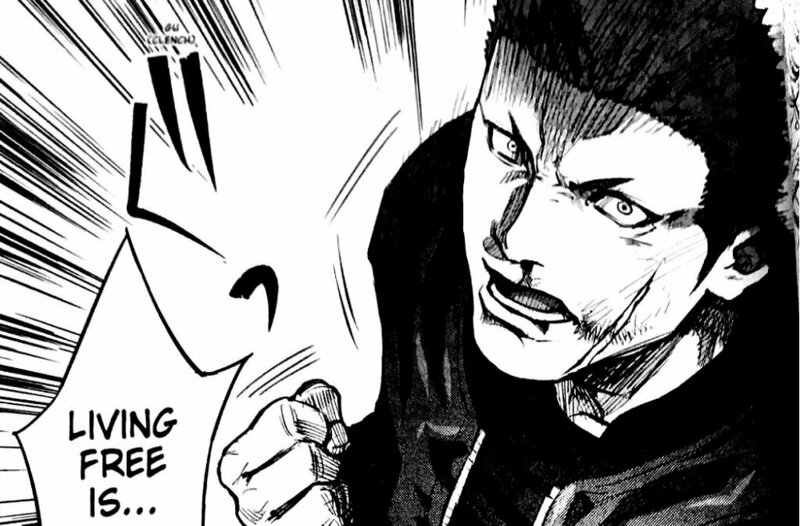 Though Okada doesn’t go into great detail with these characters, he brilliantly uses their interactions, dialogue, and point of view to show us who they are and what’s important to them. This creates characters that you want to learn more about and that you feel more of a connection to. One of particular interest is Mii, a female stray that Ryuusei takes an attraction to. Having lived a life on the streets, Mii is a bold and feisty addition to the cast of characters, and it’ll be interesting to see how her relationship with Ryuusei develops. Mii is having none of Ryuusei’s flirting. Along with interesting characters, the artwork is strong in this volume. Dark, detailed backgrounds make the characters pop and delivers an atmospheric feeling of the dank and dirty streets. Different camera angles pull you into the fight scenes and make you feel like you’re right in front of the action. Also, each character is highly detailed, which helps set them apart and make them more memorable. However, one of the manga’s most enjoyable artistic choices is its varying art style between the hard, gritty street thugs and the playful, sometimes silly street cats. Not only does this work well for landing the humor, it also shows an interesting, unique perspective of how cats act when viewed as humans, helping us understand them a little more. Nyankees was a happy surprise. It delivered the animal cuteness I went in for and surprised me with its well-timed humor, interesting characters, and fast-paced action. Though I’m not sure where the story is going, my hope is that the plot gets more fleshed out as the story continues. Either way, I’m sure the series is bound to give me plenty of laughs and I can’t wait for the next volume. If you’re looking for something cute and a bit different, I recommend giving Nyankees a try! You can read more about “Nyankees” on Anime-Planet, and order it through Amazon. Special thank you to Yen Press for giving us the opportunity to review this manga.